At a family celebration a couple of years back, I had the chance to see panoramic views of my city. 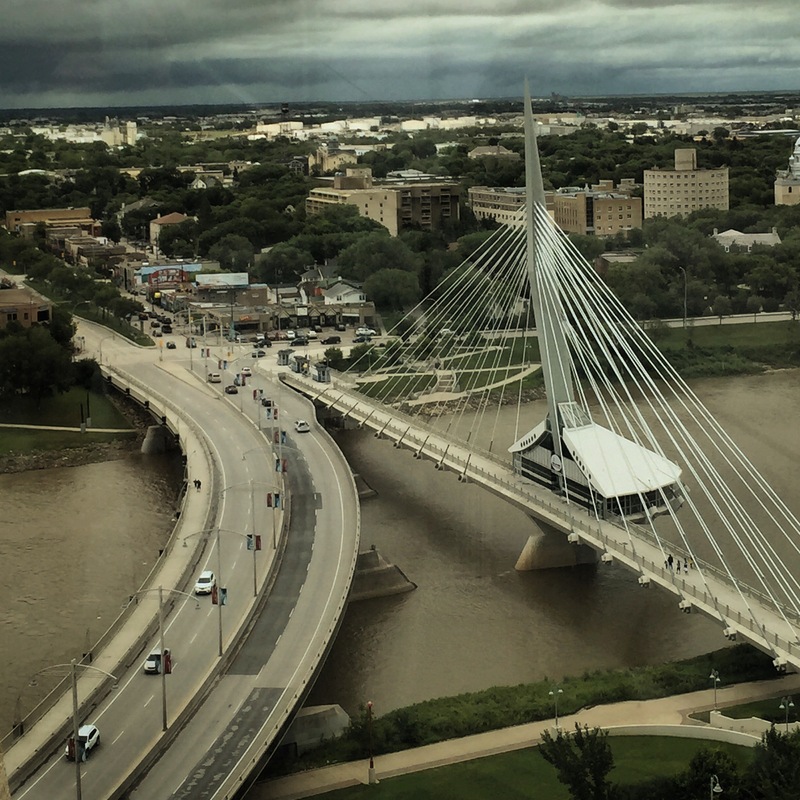 One such vista was of the Esplanade Riel, a pedestrian bridge spanning the Red River alongside the Provencher Bridge, which carries vehicle traffic. Esplanade Riel and the Provencher Bridge represent much more than simply a way to traverse the murky waters of the Red River. They connect English-speaking Downtown Winnipeg with St. Boniface, a primarily French-speaking neighborhood in which Louis Riel, the father of Manitoba, was born. Esplanade Riel — photo by Krista. What struck me most, seeing it from high atop the city, was that Esplanade Riel’s striking design is anything but “pedestrian,” which also means “lacking inspiration or excitement; dull.” It seems fitting that such a beautiful walkway is the path that connects people of different languages and cultures. What does pedestrian mean to you? Perhaps this is a great chance to go out and practice some street photography. Maybe you’ll capture something truly “pedestrian” — something that could use a dose of inspiration. Regardless of how you interpret this challenge, I’m looking forward to seeing the results. What’s going on at WordPress? The functionality-problems are getting worse! Sorry you’re having trouble! Something specific with your site? It’s YOUR site, Krista! The comment-function appeared not earlier after ~20min, my pingback not all till now. Everyone could see that. Yes, there was a problem where pingbacks and comments were turned off — I caught it 20 minutes after publication and turned them on. Sorry for the trouble, Tom! Maybe we need a walk on the wild side with this one! Great challenge as always! Here is my submission! Krista, I completely agree with your analysis. The Canadian Museum for Human Rights not only makes the perfect lookout for your bridge and Old City, but the museum’s message is also too important to dismiss as pedestrian. Your photo essay of the CMHR is lovely! Most readers won’t know that the museum sits just outside the photo to the left here. While this particular challenge is focused specifically on Esplanade Riel, I did share a photo challenge on the CMHR here, with the theme of “Inspiration.” I agree, the CMHR is certainly not pedestrian! Glad to hear this was a true challenge, Sandra. I had to get the other half’s permission to post that! 🙂 Thanks Krista. Very nice photo. I first thought that was in Europe then after reading realized that is in Canada. A beautiful bridge, Krista. It most be special to walk there. Love the challenge this week Krista, hope you like my rather twisted interpretation? Andy, did you mean to share a link to your interpretation? I see the link to the challenge above. Love it! Definitely not pedestrian at all — what an intriguing angle, too! I love this weeks challenge. I’ll definably upload my photo soon. Quite an intriguing challenge today …. I was torn between actual pedestrians or the lack of excitement; dull; disenchantment as in the dictionary. I chose the more obvious. Hope you enjoy my slections as much as I enjoyed your example for the challenge. A walk on the beach — so many opportunities to interpret the theme. Nicely done! I have published a new post on my blog, Go check it out (link below), appreciate if you could give me advise on what I need to improve on my blog. Also, I would like to have a more connection. Having said that, let’s follow each other. I would love to read all your old and future blog post. If you’re looking for feedback on your blog, the best place to visit is our <a href="https://dailypost.wordpress.com/category/community-pool/"Community Pool feature — there you’ll meet other folks looking to connect by encouraging one another in their blogging endeavors. This is really for folks who are interested in participating in the photo challenge. Thanks for understanding! Enter Romeo, my virtual pedestrian. Here’s my contribution for the week. Love your reference to the definition of ‘pedestrian’ and how you put this lovely bridge in a far more appropriate context of anti-pedestrian, because it is! It’s anything but dull, and infact the antithesis of it. I always enjoy reading your posts. They offer really neat and thoughtful insights into things that I think are highly worthwhile to consider. Wow, thank you so kindly! A great choice and photo to go with.. The women in pink — a fascinating find or friends / family? Hi Krista. Thanks for asking. I was walking along Main Street and found all those lovely women sitting on a bench. I stopped to speak with them and ask permission if I could take their photo, which they happily obliged. All of the women really are sisters to each other. It’s a special private club. They all were out to enjoy the day in Tennessee. That’s wonderful! Thanks so much for sharing the story of your photo. What a magnificent photo, Krista. The panorama contrasted so with the suggestion of mundane, attached to “pedestrian”. An excellent response to the challenge. Award for most adorable pedestrians! Ah, the MBS! Great interpretation of pedestrian. “Pedestrian” is a home game for street photographers…. Nicely done, @SoN! My favorite is the image taken through the bicycle spokes. Very creative! Thanks for sharing your link. I’m sorry that pingbacks aren’t working for you. They can be inconsistent, though I’m afraid it’s not something that is prioritized to be fixed. Pedestrian: Evening Walk 5 – What's (in) the picture? Pedestrian: South Cape Town – What's (in) the picture? Pedestrian: Walk on Sunday – What's (in) the picture? TINY LESSONS BLOG The Last Day. Anno 79 A.D.
Pedestrian: Evening Walk 4 – What's (in) the picture? Barrio Santa Cruz, Sevilla – Oh, border! Do What You Wish Imprint. Pedestrian Evening Walk 3 – What's (in) the picture? Wobbly Walk across the Ness – Dutch goes the Photo! Second Wind Leisure Perspectives Do You Walk a Pedestrian Path? Is Nahargarh Fort Best Sunset Point in Jaipur? – Jaipur Thru My Lens !! Pedestrian: Evening Walk 2 – What's (in) the picture? Pedestrian: Evening Walk – What's (in) the picture? the15thday tuesday evening, late…little tipsy maybe?! Weekly photo challenge : Pedestrian – Salle de shoot. SERENDIPITY SO MANY PEDESTRIANS, SO LITTLE TIME. Life is for Living Every Day Time to go! Giggles & Tales Weekly Photo Challenge – Pedestrain! Ouch!! My back hurts!! Pedestrian – or a Walk on the Wild Side? The Land Slide Photography I’ll Just Watch From Here. Weekly Photo Challenge: Pedestrian – Excited Neurons ! Simply Photos Where is Everyone?